This is the third post in an ongoing series about a journey on the Tran-Siberian Railway my father I took in August/September 2013. If you missed earlier posts, you can read Part 1 and Part 2 first. Russia, the mighty bear, former red Soviet Union, land of hammer and sickle, swirly colorful rooftops and a capital where spooks and nefarious characters lurk in the shadows. These were some of the images running through my head as my plane touched down in the capital Moscow, remnants from Grade 9 Social Studies class when Gorbachev was about to demolish the Iron Curtain. Twenty-six years later times have changed greatly and I knew not to solely believe what I was taught in school. My mind was wide open and ready to be surprised. In a car heading to the hotel where my dad was waiting, I was first struck by how much like my native Canada it looked. A four-lane highway cut through thick forest as we made our way from the outskirts in to this busy city of 15-million. First referenced in 1147, Moscow was sacked by Mongol invaders in 1237, has been built, attacked, rebuilt and burned down a staggering number of times. Its connection to Mongolia was fitting, as we were to catch the fabled Trans-Siberian Railway in four days to its capital Ulaanbaatar, thousands of kilometers away. Being the first stop of our father-and-son journey, it was imperative to start things on the right foot to ensure smooth sailing over the next three weeks. I have a tendency to take control and made sure to back off and give my dad the lead planning days. He was keen to suggest spots to go and appointed me navigator. This partnership worked out perfectly and in to Moscow’s subway we went. I was expecting most of the city to be comprised of grey and army-green-colored facades, vodka vending machines on all corners and semi-desperate looking shops. This was not the case. Vibrant colors covered many buildings, people were dressed in modern duds and it was quickly evident Moscow is a global city that’s very comfortable on the world stage. And I didn’t see a single vodka vending machine the entire time – a huge disappointment! Being in Europe (the Ural Mountains serve as Russia’s dividing point between Europe and Asia) it shouldn’t have been a surprise that many of Moscow’s buildings were very European in appearance, but I was. Colorful neighborhoods, especially near the Kremlin, featuring intricate facades created a much more interesting and cosmopolitan city than my Social Studies class had related. A neat feature of buildings under construction are giant blinds covering the site, featuring a scene of what the area will look like. This is an aesthetically minded people and city. Food and drink is varied and also rather pricey. A pint of lager was about $9US, KFC had the lowest priced one at $3.5US and our most expensive was $12US. We spotted very few pubs, which was a surprise. I’m not sure where everyone is drinking but they’re sure keeping it under wraps. The culinary highlight was a Georgian feast of potato dumplings, a pizza of sorts, specialty baked bread filled with cheese and a couple ubiquitous shots of chilled Russian vodka. Moscow’s subway system makes getting around a breeze and is an ideal opportunity to take in Russian architecture and art while commuting. Older stations feature chandeliers, works of art depicting the Soviet spirit and long curved rooflines, imparting a feeling that you’re on the way to the opera rather than in an underground. Stalin wanted metro stations to promote Soviet virtue and also designed them to serve as bomb shelters in the case of war. 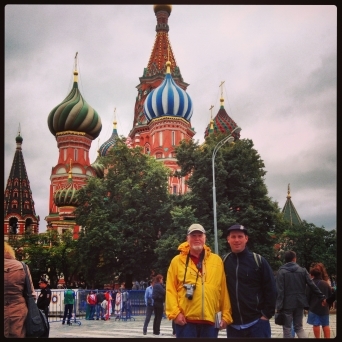 At $1US per journey, exploring an otherwise expensive capital was a snap and great deal. 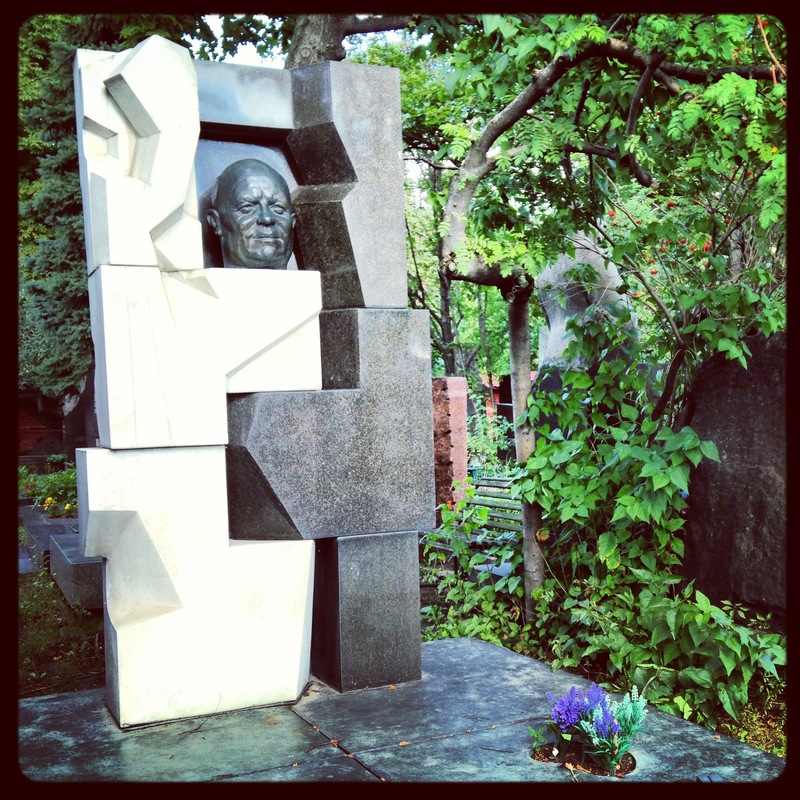 Other standouts included Novodevichy Cemetery which features highly elaborate tombstones including Nikita Khurshchev’s. 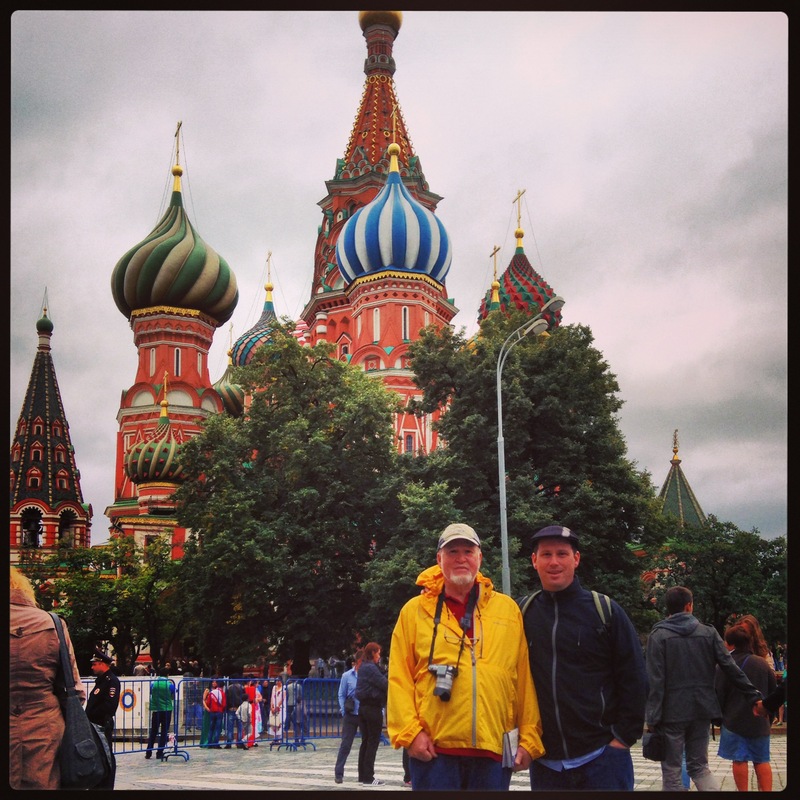 Walking amongst so many ornate memorials was a supreme venue to soak-in a bit of the Russian soul. 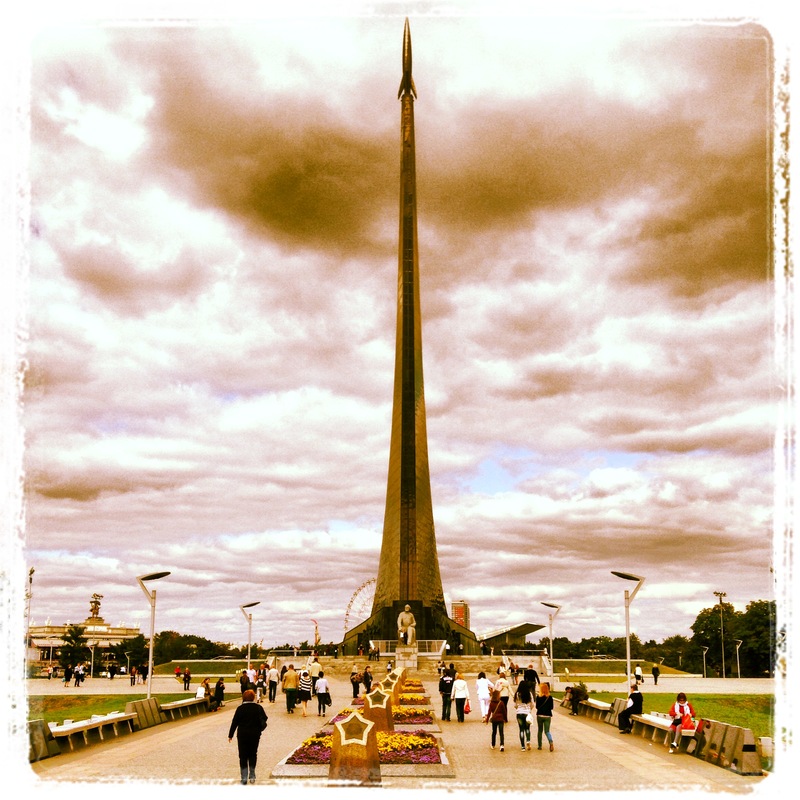 The Cosmonautics Memorial Museum showcases the history of Soviet space exploration as well as that of international efforts. Models and real life replicas are on display, including two stuffed dogs that were the first animals in space. And then there was the people themselves. Moscovites are a surprisingly diverse bunch. There are a broad variety of faces, cultures and styles that form the human landscape of this rapidly changing capital. Spanning two continents and still the largest country on earth, Russia’s citizens come from all corners of the country to call Moscow home. While smiles don’t abound, we were regularly offered help when looking at maps and there’s little question comrades would have come to our aid if needed. In Part 4, crossing Siberia and Mongolia by train will be explored. Thank you. Friendly and easy to read. Clear as a bell. Reminds me of how I discovered US back in 1996. I was ready to see something I’d expected and I got much more interesting and surprising. A good guide for those who always seek and find.